PRISTINE, open-plan LUXURY RETREAT in highly-sought neighborhood, INGROUND POOL, lush landscaping, BACKS TO WOODS for privacy. QUALITY-built by Aiello Homes. 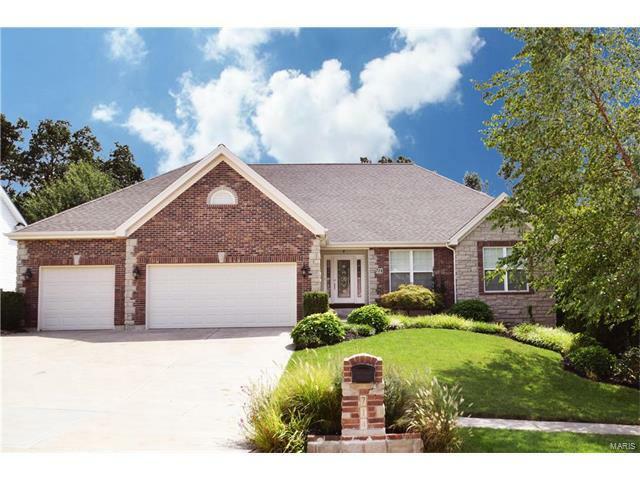 4+ bedrooms, 3.5 baths, 4248 SF including FINISHED WALKOUT LOWER LEVEL. Brick & stone elevation, OVERSIZED 3-CAR GARAGE. Stunning great room with cozy fireplace, built-ins, WALL OF WINDOWS overlooking backyard paradise. SOARING CEILINGS, recessed lighting, custom trim & GLEAMING HARDWOOD. Opulent kitchen with 42" cabinets, RARE GRANITE, high-end SS APPLIANCES, center island, planning desk, breakfast room with another wall of windows, plus formal dining room. Double doors to master suite, bay window, spa-like bath with jetted tub, separate shower, dual vanities, water closet, elegant tilework. Iron spindle staircase down to fully-equipped WET BAR, 4th bedroom, bath, step out to GORGEOUS POOL, garden, fire pit, 2 patios. Upscale black aluminum fence. WALK to shopping & restaurants. 1-yr HSA home warranty provided. Agent owned. From Hwy 70 head north on Wentzville Pkwy, left on William Dierberg Dr, left on May Rd, right on Winding Creek Dr, home is on the left side of street. WELCOME HOME!